The two sites in Newport closed off because of suspicious items have now been re-opened. Gwent Police said they believe the incidents were not terror-related. Assistant Commissioner Mark Rowley, who leads on counter-terrorism policing nationally, confirmed the US and UK are now sharing information again after "fresh assurances" from across the Atlantic. He told the BBC: "We greatly value the crucial relationship with our trusted partners around the world so we can collaborate and share sensitive information to defeat terrorism and protect the public at home and abroad. "While we do not usually comment on information-sharing arrangements with international law enforcement organisations, we want to emphasise that, having received fresh assurances, we are now working closely with our key partners around the world including all those in the 'Five Eyes' intelligence alliance." The Five Eyes alliance is made up of Britain, the US, Canada, Australia and New Zealand. After three hours of a police cordon and a bomb disposal unit taking over their street, residents are able to return home. The family of a teenager left in a critical condition after the Manchester bombing have thanked emergency services for all they have done. Laura MacIntyre went to see Ariana Grande with her friend Eilidh MacLeod, who died from her injuries. "Laura and her friend Eilidh were so looking forward to the concert, but that night has now ended in a tragedy where Eilidh has lost her life and Laura is in a critical condition," they said. "Our hearts and minds have been with Eilidh's family since we heard their news. "We know that Laura is in the best possible place and is receiving the best care that she can. Laura is strong-willed and a fighter." Information sharing has resumed between the UK and US, the BBC understands. The Home Secretary confirmed on Thursday sharing of information between security services and police would stop after the name of the Manchester bomber and photos from the crime scene had been leaked to the US press. But now a decision has been taken to end the temporary suspension after assurances were received by counter-terrorism officers in the UK. Hundreds of bikers released pink balloons as they drove from Bury to Manchester with her mother and stepdad. The family organised the rally as they are keen bikers themselves. The government's emergency Cobra committee will meet in Whitehall on Friday morning to discuss the latest developments in the Manchester inquiry, Downing Street has announced. The meeting, chaired by Home Secretary Amber Rudd, brings together senior ministers and officials with representatives of the police and security agencies. Greater Manchester Police have said they found "potentially suspicious items" during a raid in Wigan today. The force has put up a large cordon this afternoon and evacuated the street nearby the local hospital. BBC news correspondent Danny Savage reported seeing a bomb disposal team and robot on the street. The police statement said: "A house in Wigan was raided this morning and is currently being searched. Potentially suspicious items were found at the address and a large cordon has been put in place as [bomb disposal teams] make an assessment. "We have a number of officers on the ground and are evacuating people as a matter of precaution as public safety is paramount to our investigation. "We are working with the local authority to accommodate those who have been evacuated." BBC news correspondent Danny Savage is on the scene in Wigan where police have cordoned off a street where they were earlier searching a house. Quote Message: We were down there on that street earlier on and all the local residents were as well, standing outside their houses in the sunshine as police examined a property which was raided at about midnight last night. Ever since then, there has been police activity at the house. But what is clear is that some time late this afternoon, about 18:00 BST, they found something they didn't like, that they were worried about and therefore they called in the bomb disposal unit and quickly cleared all the residents from the street." We were down there on that street earlier on and all the local residents were as well, standing outside their houses in the sunshine as police examined a property which was raided at about midnight last night. Ever since then, there has been police activity at the house. But what is clear is that some time late this afternoon, about 18:00 BST, they found something they didn't like, that they were worried about and therefore they called in the bomb disposal unit and quickly cleared all the residents from the street." 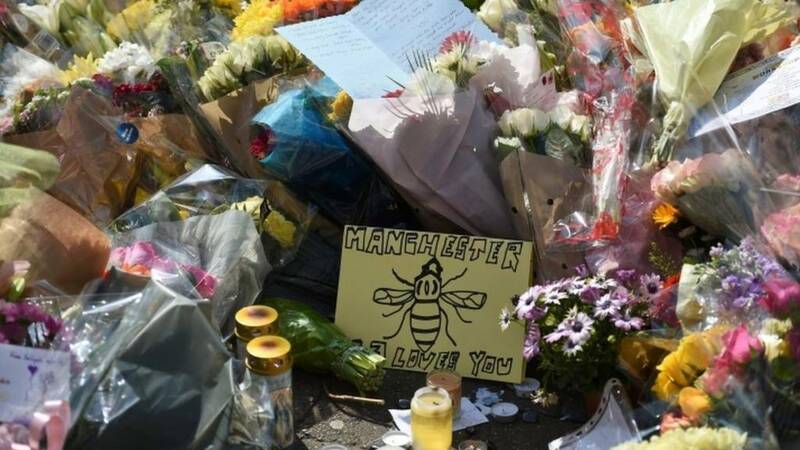 A photo of an armed policeman blowing a kiss to a group of people holding a free hugs sign has "captured the spirit of Manchester", according to CNN. Read more and view the picture here. Even people standing for election have joined in getting the Manchester bee tattooed as a tribute to those who lost their lives and to a city in mourning. The Lib Dems removed their party political broadcast from television tonight to replace it with a personal message from its leader about the Manchester attack. Hundreds of well-wishers have formed a convoy of bikes, scooters and cars to pay tribute to 15-year-old Olivia Campbell. The bikers - wearing pink ribbons and flowers - let off pink balloons for Olivia as they made their way from her hometown of Bury to Manchester at 19:00 BST. The tribute was organised by her mother and stepfather who are keen bikers. The family plan to see the floral tributes to Olivia in St Ann's Square and make their own tribute to the other 21 victims of the attack. Missed opportunities? Or too difficult to uncover? We've learned over the last couple of days that the Manchester killer had been on the security services' radar, but what was specifically known about him isn't quite clear, other than he wasn't a priority for investigation. So how does MI5 make these incredibly challenging judgement calls over who to watch and who to put to one side? It has to priortise - putting attack-planners at the top of the list and the hangers-on at the bottom. My blog this evening looks at how bewilderingly difficult these decisions are - and where Salman Abedi may have fitted into the bigger scheme of priorities. "I know this not only because of the confidence I have in our military and our intelligence services and our law enforcement - but mostly importantly because I know the character of our peoples. "And you can see it in the way that the people of Manchester responded - not simply with fear but resolve and with kindness and solidarity and a willingness to help people who are in need. "That's why I believe we will prevail because our way of life is stronger." Roads surrounding Springfield Street in Wigan are now being closed off too and residents are being told to leave their properties. I can only think the day long search at a property in the street has uncovered something of concern. Police in Wigan are clearing Springfield Street where an arrest was made in connection with the Manchester bomb attack. The street near the hospital in the town was closed off at 18:20 this evening. Simon Byrne, Chief Constable of Cheshire Constabulary, has paid tribute to killed policewoman Elaine McIver. "Elaine was someone who cared about communities and someone who cared about victims," he told the BBC. "She left a lasting impression on those who met her." Det Con McIver, 43, joined the Cheshire Constabulary as a special 20 years ago. She worked in a regional crime team in Warrington. "It’s a dark day for us," Mr Byrne added. "It's rocked the core of the organisation." He added: "We've been touched by the outpouring of support from the wider police family."